Training, based on the German Dual System of practical and theoretical learning, has been one of the key roles and services of the German Chambers of Industry and Commerce abroad. 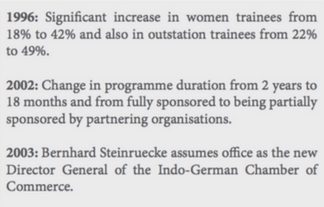 To extend this service to member companies in India and to provide them with a common management training platform, the IGCC established the Indo-German Training Centre (IGTC), Mumbai in 1991, Chennai in 2005 and Bangalore in 2008. “Welcome to the Indo-German Training Centre! For more than 25 years, we are a collaborative community passionate about management training and development. Our core is in the German Dual Education System and this steers our flagship Post Graduate Programme in Business Administration. We go beyond the traditional academic methods to partner with the Indo-German business community entirely and give them a solid, common platform to not only be dream destinations for trainees, but also a full partner in the learning process. Corporates drive admissions, academic learning modules, on-the job training and final recruitments. They interlock academic coursework with maximum exposure in the organisations, so that the young trainees can apply their acquired knowledge to live, practical projects. Undoubtedly, the trainees thrive in such a learning environment, stretch the boundaries and deliver results in the organisations. Along with the corporates, the esteemed faculty members make the critical contribution and ensure that academic inputs and conceptual clarity are delivered without compromise. The trainees enjoy every learning opportunity, assimilate and display their merit. The IGTC team focuses relentlessly on enabling the trainees to develop the essential soft skills and positive energy that is required to tilt the balance in their favour. The trainees differentiate themselves as good human beings with the right values. The IGCC Committee Members, Director General Mr. Steinruecke and all the colleagues prioritize and promote training as one of its key services. The trainees live up to their promises made. It is no surprise that the training imparted converts into final placements, and the belief in the formidable German Dual Education System has been completely reinforced and has been multiplying among the trainees, faculty, HR partners, corporate recruiters and alumni. IGTC has been artfully maintains the delicate balance among all these stakeholders and attains synergy. This has not only sustained the Post Graduate Programme in Business Administration (PGPBA) over years, but has also emboldened us to double capacity and cater to an ever growing number of partnering organisations. Supplementing this growth story at IGTC, has been the launch of the strongly conceptualized, comprehensive Executive Business Management Programme (EBMP) in Mumbai in 2010 and subsequently in Pune in 2015. By training high performing managers from member organisations, this programme has proved to be the greatest credibility-enhancer for IGTC in the shortest span of time. We stand humbled by its success. And once again, the credit goes to the sheer brilliance of the teaching faculty. It has been an enriching and fulfilling experience to meet the expectations of the seasoned managers, who come ‘back-to- school’ to learn. Adding value and smiles to the lives of this mature audience pushes the IGTC team to another level of responsibility and responsiveness. IGTC’s has also launched two other critical initiatives. The first has been the formation of the Indo-German HR Partner Forum, an initiative to connect the senior HR partners on a common platform and to facilitate collaboration among them. This has developed into a professional camaraderie that continues to mutually benefit all the organisations and individual partners in multiple ways. This unbiased and selfless effort from IGTC has brought it immense respect and recognition. The second initiative has been the collaboration with the Baden Württemberg State Cooperative University, Karlsruhe for a mutual student and faculty exchange programme. Officially titled ‘Business Environment Germany / India’, the annual study programme has gone way beyond its objectives to foster an unforgettable, intercultural experience. It has also given IGTC visibility on the international platform. What is most unique to IGTC is the feeling of ‘oneness’ and ‘being a family’ that every IGTCian has felt during their tenure at IGTC, be it the PGPBA or EBMP students. The bond that the alumni retain with the institute, keeping us abreast of their professional and personal lives, is our priceless treasure. The alumni achievements, by scaling heights on the corporate ladder to hold senior and meaningful managerial positions in organisations, is the biggest testimony of our success. IGTCians at heart, phenomenal we will be! Leaders of tomorrow the very, very best! The Indo-German HR Forum launched ‘Horizon Redefined’ am HR Capability Building Initiative. IGTC hits a century with 100 students inducted into the PGPBA Batch 2017-2019. IGTC celebrates its 25th Anniversary, Alumni Reunion and Homecoming. Based on the growing requirements of partnering organisations, IGTC Mumbai doubles capacity to 80 trainees. IGTC makes a foray into Pune with its successful One Year Executive Business Management Programme, the first batch consists of 46 managers sponsored by 13 organisations. Sarjak Parekh and Shashank Chandrasekharan are selected for ‘Make-it-in-Germany’, a programme of the German Federal Ministry for Economic Affairs and Energy (BMWi). “Business Environment Germany”, the first two week student exchange programme is hosted by DHBW, Karlsruhe for 26 IGTC students. Vivek Komath from IGTC is selected as the first “CAReer Trainee” from India by Mercedes-Benz India Pvt. Ltd. and is inducted to the world of Daimler among 32 trainees from 10 different nationalities. 1000th trainee, Dhanyashree Thykatil, graduates from IGTC and receives a special plaque from H.E. Ambassador Michael Steiner. The Federal Ministry of Education and Research (BMBF), Germany awards a Certificate of Recognition to IGTC student, Ashwin Jayaraman for being trained by the German Dual Education System. “Business Environment India”, the first two-week student exchange programme is hosted to give 23 DHBW students an insight into India as a growing economy. President Reinhold R. Geilsdörfer and senior representatives of various DHBW campuses visit IGTC to further crystallize on collaborations. IGTC makes its presence at the Indo-German Urban Mela by conducting a symposium on “Exploring Infinite Opportunities in German Organisations” with the HR Partner Forum. A customized Executive Business Management Programme is launched for 26 managers of Clariant Chemicals India Pvt. Ltd. and is repeated in 2013. With the support of Volker Ihle and Peter Lehmeier, collaboration for student exchange programme is formalised with the Duale Hochschule Baden Wuerttemberg (DHBW), Karlsruhe. BASF Group enhances the IGTC curriculum with a Seminar Series on “Corporate Governance and Business Ethics”; Prasad Chandran, Chairman & MD, BASF India presents the first award to Sonam Choudhary. Bayer Group launches merit-based scholarship programme “Championing Success”. Stephan Gerlich, Country Group Head and KS Harish, Country Head HR, Bayer Group present the certificates and cheques of Rs. 50000/-. Indo-German HR Partner Forum is initiated to collaborate, share knowledge and benchmark best HR practices among organisations. One-Year Executive Business Management Programme is launched to equip middle management executives of member companies with a holistic, cross- functional exposure to all aspects of management. Goethe Insitut / Max Mueller Bhavan signs a strategic alliance to award a one month German language scholarship in Germany for the Dr. Günter Krüger Award winner in each centre. IGTC Kolkata is inaugurated by H.E. Ambassador Thomas Matussek. IGTC Bangalore is inaugurated by Otto Kentzler, President, Federation of German Chambers of Skilled Crafts (ZDH). Dr. Martin Wansleben, Director General, DIHK and Dr. Juergen Moellering, Head of Legal Department, DIHK visit IGTC. IGTC Chennai is inaugurated by L. S. Ganesh, Head of Department of Management Studies, Indian Institute of Technology (IIT), Chennai. H.E. Ambassador Heimo Richter, presents the first Dr. Günter Krüger Award for Excellence to Jaykumar Waghela, a trainee recruited by Eirich Transweigh. Dr. Günter Krüger Award for Excellence is instituted in the memory of the Late Dr. Günter Krüger, and is henceforth to be presented to the Best Performing Student of every IGTC batch. “Menace” or “The Management Rat Race”, a version of the Harvard Business Game, is introduced by G.C. Dore, General Manager, Siemens Ltd.
H.E. K. S. Rana, Indian Ambassador to Germany awards certificates at the Convocation Ceremony of 1st IGTC Batch 1991-1993. Goethe Institut / Max Mueller Bhavan joins hands with IGTC. Volker C. Ihle, IGTC Director with the first batch of 22 trainees. H.E. Dr. H.G. Wieck, Ambassador, Federal Republic of Germany and H.E. C. Subramaniam, Governor of Maharashtra light the inaugural lamp.